Our Customers – one of the best parts of our business. 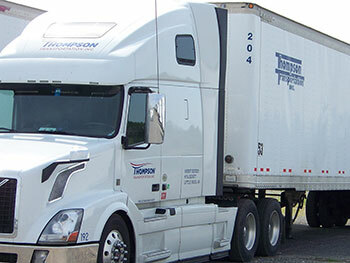 Thompson Transportation Dry Van Division provides dependable service to 36 states, with a well-maintained fleet of 45 tractors, and 100 trailers. We pride ourselves on ensuring the safety of our drivers, so our average age of equipment is less than 2 years old. We are satellite dispatched, and are able to track shipments and provide quality service to all our customers.